The foundation of the Feingold Diet is avoiding all dyes, artificial flavors, and certain preservatives. There are two stages to the diet, stage one and stage two. On stage one where you will start out at for at least 6-8 weeks, you will also be eliminating high salicylate foods such as (but not limited to) tomatoes, cucumbers, peppers, oranges, apples, berries, grapes, almonds, certain spices, and certain vegetables. There is a long list which I’ll include at the end of this post. Some stage one foods are bananas, pears, lemons, limes, canned pineapple, cantalope, watermelon, honeydew, kiwi, grapefruit, mango, papaya, etc. I’ve heard so many people say they want to try the Feingold Diet but they have no idea where to start. So, here are 6 steps to help you get started and moving in the right direction. 1. Join the Feingold Association of the United States – ADHD Diet Facebook group. There are currently over 9,000 members. This group is open to anyone. You just need to request to join. There are lots of Feingold members on this board, as this used to be the only Feingold Facebook group. Last year, they opened a new one for members only where you can discuss brand names. They ask that you not ask or discuss brand names on this board, but you can ask all the questions you want about the Feingold Diet in general, or just read and learn more about the Feingold Diet. This is a great place to start if you are just wanting to learn more about the diet first. If you are already a Feingold member, the first thing you need to do before anything is join the Feingold Association of the U.S. Members Group on Facebook. E-mail feingoldfacebook@feingold.org and request to join. 2. 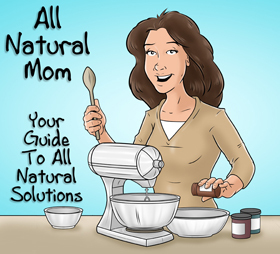 Follow All Natural Mom on Facebook. I give tips almost daily on how we do the Feingold Diet. Also, read through my blog here. I have over 50 blog posts related to the Feingold Diet. You can also follow me on Instagram at Allnaturalmom4. If you are on Facebook, it’s very easy to join Pinterest. As soon as you go to www.pinterest.com, you will be asked to join or log in. It will ask you if you want to join using your Facebook account. That’s what most people do. It takes about 2 seconds to get on. Literally. They’ll automatically show a few people in your Pinterest feed that you are friends with on Facebook. You don’t need to do anything with your own boards if you don’t want to but you’ll want to follow other people’s boards and do searches. You can do a search for “Feingold” and view recipes, food products, blog posts etc. relating to Feingold. Install a Pin It button to your computer and phone or tablet so you can easily pin things to your Pinterest board. Many Feingold members have Feingold related pinterest boards. When you see a board you like, hit “Follow” at the top of their board so you start to see those in your home page. You also want to be on Pinterest so you can look up recipes. Follow my Pinterest boards, www.pinterest.com/allnaturalmom4. I have all kinds of boards, nearly all related to Feingold. Feingold Food Products, Feingold Fast Food, grocery lists by store (Wal-Mart, Target, Whole Foods, etc. ), etc. I’m still updating these and adding new boards all the time, so it’s best just to follow all of my boards. I don’t have everything sorted by stage one and stage two yet and approved items can change at any time, but it’s a good reference and will give you an idea of the kinds of foods that are allowed on the Feingold Diet and where you can find them. We also do GFCF (gluten and dairy free) so you’ll see a Feingold+GFCF board on there as well. I also have a Pinterest board called, “Starting the Feingold Diet” with helpful links and posts. 4. Read Some Good Books! When you’re not reading on the Feingold Facebook group, check out some books from your library on the Feingold Diet. 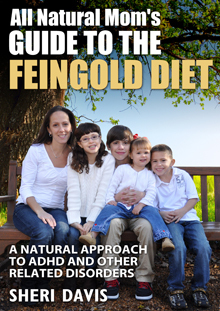 You can get my book, “All Natural Mom’s Guide to the Feingold Diet – A Natural Approach to ADHD” on Amazon. You can read the first two chapters on Amazon for free. Or request that your library order it. I give a lot of information on how to start the diet as well that you won’t find in the membership materials. I share our personal story of why and how we started the diet, and provide a lot of insider information that you’ll eventually pick up from reading on the members Facebook group. But it’s information that would be really helpful to know from the start. “Why Can’t My Child Behave?” by Jane Hersey. You can read the first three chapters online here. This one is over 400 pages and covers just about everything. Your library should have it. Dr. Ben Feingold’s book, “Why Your Child is Hyperactive.” I’ve not read this one. It may be a little outdated but contains some good basic information. Once you have a basic understanding of the Feingold Diet and why you’d want to change your child’s diet, you want to look through your pantry and remove all dyes. This includes red, yellow (sometimes listed as tartrazine), blue, and any other foods with wording such as “artificial colors” or “colors added.” Those are not natural colors. Just look for the obvious ones for now and move those up to a top shelf for “Daddy” or whoever. Just don’t feed them to your “target” (the one you want to do Feingold for) anymore. For substitutes for those foods, check out my Pinterest boards. Why remove dyes before even starting Feingold? Because removing dyes should give you enough relief in the ADHD behavior so you can spend some time researching, grocery shopping, and coming up with new recipes with approved ingredients. And if you order the hard copies of the membership materials, you’ll have about two weeks to wait for your membership materials. That’s a long time! 6. Order a Feingold Membership. 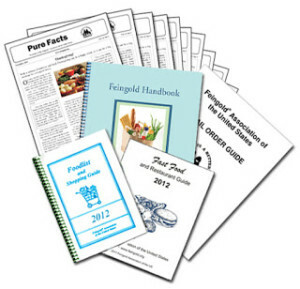 For more info on the diet and what is included, check out Feingold’s web site, www.feingold.org. Can you do the Feingold Diet on your own? Yes, but I wouldn’t want to. Feingold takes all the guesswork out of it for you and researches these foods with the manufacturers. They provide you a shopping guide which tells you all the foods that are safe and also lists out foods that are stage one or stage two. Some artificial ingredients or preservatives are hidden or used in the packaging so there’s no way you would know unless you called the company and hope they give you an honest answer. And here’s an excerpt from chapter 5 of my book which lists out some stage one and stage two foods. 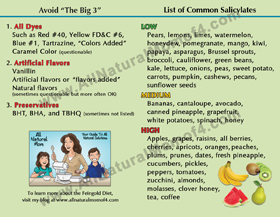 “Below is a partial list of high, medium, and low salicylates. This is a list of the more common foods. For a complete list, see Feingold’s handbook, which comes with a paid membership. A salicylate list is available on the Internet but it varies slightly from Feingold’s list. I trust Feingold’s list. It has been tested and found to be valid over and over by its members. Fruit: Pears, lemons, limes, watermelon, honeydew, pomegranate, passion fruit, mango, kiwi, papaya, guava, etc. Veggies: Asparagus, Brussels sprouts, broccoli, cauliflower, green beans, kale, lettuce, olives, onion, peas, sweet potato, carrots, pumpkin, parsley, etc. Nuts: Cashews, pecans, sunflower seeds. Maple syrup and a long list of spices are also low salicylate. Veggies: White potato, spinach, etc. Spices: Cinnamon, oregano, sage, cumin, and more. Other: Honey (except for clover honey). Fruit: Apples, grapes, berries (including strawberries, blueberries, raspberries, etc. ), cherries, apricots, grapes, raisins, nectarines, oranges, peaches, plum, prunes, tangerines, dates, fresh pineapple (note canned pineapple is a medium salicylate), etc. Veggies: Cucumbers, pickles, peppers, tomatoes, zucchini, etc. Spices: Cloves, oil of wintergreen, red pepper, paprika, chili powder, cayenne, rosemary, dill, ginger, and more. Tea and coffee are also high salicylate. For a comprehensive overview of the most effective ways to treat ADHD naturally, register for the Treating ADHD Naturally Conference coming to Colorado Springs, CO May 24th, 2017! Register HERE. 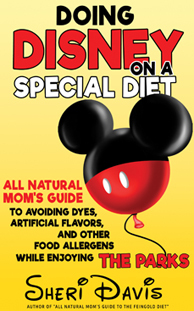 Posted in Feingold Diet and tagged adhd, all natural mom, All Natural Mom's Guide to the Feingold Diet E-Book, Dye-Free, Feingold Diet, Feingold Diet Info, Sheri Davis.